"With so much death, it's a wonder the grass doesn't come up red instead of green." For centuries, the Three Kingdoms have warred endlessly. The river flowing through it holds so many dead on its banks that the locals call it the River of Blood. But now, a new peril rises. With all three armies tucked into their winter camps, patrols and outposts on all sides report ambushes with alarming frequency - those who survive to make their reports, that is. None can say just who attacked them, however, for the assailants appear from the fog or in the middle of a snowstorm, hit hard and fast, then disappear. Arden, Duke Regent of Tyndall, fears that the dead have risen to haunt the living. Is he right? 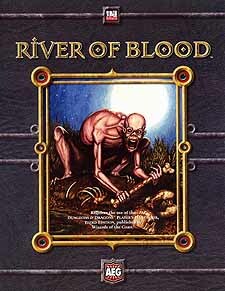 River of Blood is an advenrture designed for four to six characters of levels 7-9. The rulers of the Three Kingdoms seek brave souls to explore the length of the Pauvaas River and uncover the mystery shrouded by centuries of violence.